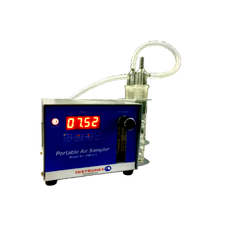 The special air sampler created for monitoring isolators and rabs, withcomplete separation from outsideinfluences. Particle Size: Omni-directional air inlet with PM 10 separation through an impactor Followed by PM 2.5 separations through a WINS Impactor. Sampling rate: Constant sampling rate of 1m3/hr unaffected by voltage fluctuation And Filter choking maintained by critical orifice system. - Rechargeable Battery with Run time 10Hrs. 1. There are numberless micro-holes on the sampling head to make the microbes spread on agar evenly to reduce the counting difference. 3. Flow speed at inlet on sampling head: 0.38m/s, which is nearly consistent with the wind speed in room. (isokinetic sampling). 4. The sampling amount can be set up from 0.01 to 2.0 m³. Fully complied as per ISO 14698-1 guidelines. Inbuilt flow sensor to monitor the flow rate throughout the sampling. Admin controlled date & time modification. HEPA filtered exhaust, hence useful system for classified sterile environment. 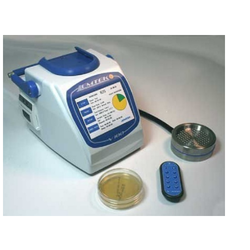 Best sampler for sterile area with remote operation. (Single remote can control 5 samplers). We bring forth vast industrial experience and expertise in this business, involved in offering high quality range of Microbial Air Sampler.